More than just a World Clock App. For iPhone & iPad. World Clock – Current local times, UTC-offsets, time zones, and time difference from your current location for thousands of cities worldwide. Accuracy – Synchronize the time within the app to display the correct time from timeanddate.com*. Reliability – Automatically updates to the databases from timeanddate.com to support time zone information changes that occur around the world. Convenience – Easily view the local time for your most viewed locations. Personalization – Choose from a variety of analog clock designs and select the type of display – analog, digital, or text clock. Customization – Add cities/locations to your Favorites, which are saved for easy reuse. Visual versatility – The application supports landscape and portrait orientation. * Synchronization and database updates require an Internet Connection. The app will still work offline, but cannot access any possible database changes until it is online again. Synchronization will not update the device clock, only the time shown in the app. Does the App know about DST? Countries are constantly changing time zones and daylight saving time (DST) schedules. 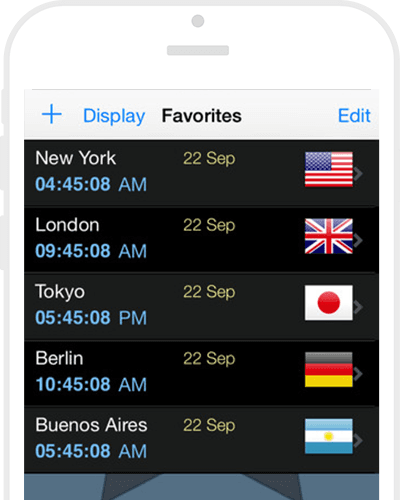 The World Clock-Time Zones app automatically takes into account these changes in all countries and territories. It is synchronized with the databases from timeanddate.com, which are monitored and maintained on a daily basis. I love it ;-) I have a friend in California. And we FaceTime a lot. This app helps me keep track of when we can do it. Depending on our time zones! I definitely recommend this to other people!! Find time difference between an unlimited number of locations worldwide. Get an overview of time zones and current local times worldwide. Zoom in on the map to see in which time zone a city is situated. Access a city's information page directly from the map. Find out when DST begins and ends around the world. Enjoy the app's many features without advertisements occupying part of your screen.